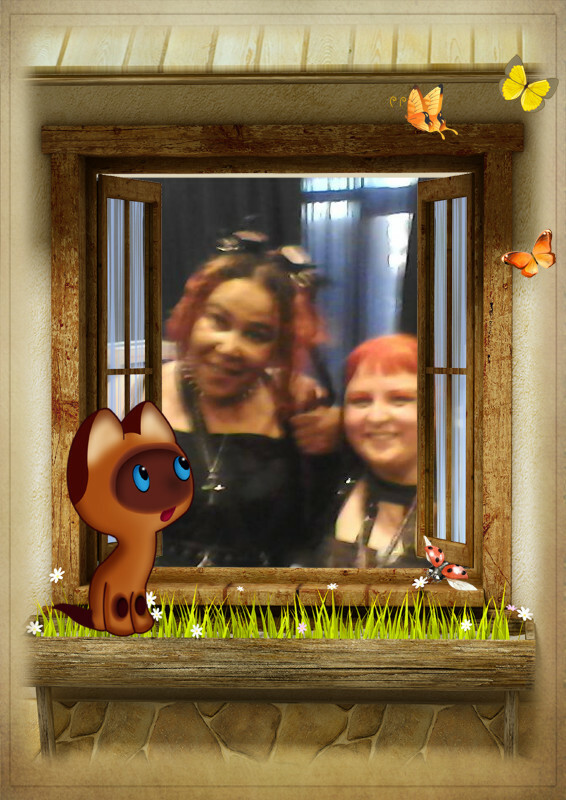 Sumiko Saulson and Emerian Rich. I would post a bunch of pictures, but apparently I need a new camera phone and new eyeballs. My only picture of me and Emerian is super blurry. Fortunately, thanks to the cutesy processing available at PhotoMania I have been able to salvage it. I would just like to state for the record, that we weren’t actually standing in a window behind a cartoon cat at any point during the HorrorAddicts.net tea. Other than that, however – I would say that the HorrorAddicts.net tea was a little bit like a gothic fairytale, and I wouldn’t have been surprised if the Cheshire Cat had shown up. 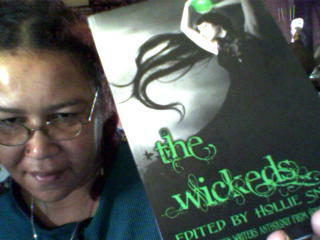 One of the important works of HorrorAddicts.net is the Wicked Women Writers competition. As you probably already know, if you are a follower of my blog, women remain underrepresented in the horror genre. HorrorAddicts was not only representing for the horror genre, meaningfully, during the thirteenth annual BayCon, but also for women in horror. It is a rare thing to find oneself sitting in a room having tea with three female horror writers. It is rare to find three women who write horror in one place at all. My first connection with HorrorAddicts.net was during Women in Horror Month 2013. WiHM and Black History Month fall in the same short month of February, and I was putting together a list of black women horror authors when I came across David Watson’s article from last year highlighting black horror writers for February 2012. As it turned out, he was in the middle of putting together a new one for Black History Month 2013. It is through his works that I came to know and have the greatest respect for HorrorAddicts.net and all they do to promote the genre in general, and to make sure that underrepresented segments of the writer population such as women in horror and black horror writers are represented. It would appear that the HorrorAddicts.net presence at BayCon is generating so much interest in the website that the redirect for the URL isn’t working correctly at the moment, so I would encourage all of you to visit them at http://horroraddicts.wordpress.com/ for the time being, until their regular url http://horroraddicts.net/ starts getting just a little less traffic. And of course, if you are at BayCon, or in the Bay Area, I would encourage you to go visit Horror Addicts, on the third floor, down the hall, just pass the Klingon Slave Auctions, and meet and speak to some of the most interesting people in horror fiction in the Bay Area. 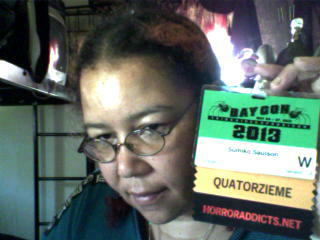 I had more fascinating conversations in my three hours at BayCon than I usually have in a month. I met Laurel Anne Hill, the intelligent and informed woman behind the San Mateo County Fair’s Author Day event, which will take place on June 15, 2013 between 2pm and 4pm. I’ll be there, and so will Emerian Rich. We hope to see you there. ~ by Sumiko Saulson on May 26, 2013. In light of the personage in the picture: Concatulations!